For this reason I also suffer these things, but I am not ashamed ; for I know whom I have believed and I am convinced that He is able to guard what I have entrusted to Him until that day. Today my nephew, Jorden, turned 17. 17. Wow. He's almost a man! He's my first nephew. I was 9 when he was born. It was snowing that night. My little brother and I were home alone when my parents took my sister to the hospital to have Jorden. I was trying to win Bon Jovi tickets on the radio. I was 9. How funny is that? And you know what? I got through! And the jerks at the radio station told me I had to be 18 to win! That made me mad... like a 9 year old can't appreciate an instant classic like "Livin' on a Prayer"! Anyway, I just wanted to mention JT's birthday. I love you Jorden and I'm so proud of the man you are becoming! Below are the lyrics to the Chris Rice song, "My Prayer". The song is a simple vignette of what it's like to talk to God. I wish I could put my feelings into words like this. I can't, so I just listen, and enjoy. You should download this song... it's beautiful. 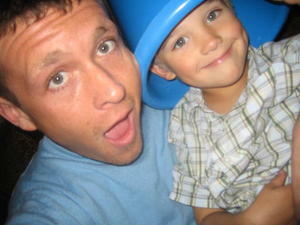 I found this picture on my litte brother's myspace page. How cute is this? Thank God it's Friday. I am so overwhelmed in my new job. It's really testing me. Testing me professionally. Testing me emotionally. Stretching me, challenging me, humbling me. I am exhausted, and couldn't be happier that it's finally Friday. I'm in love with Saturday and Sunday right now. 2 days of rest. Beautiful. My brain needs a break. It's been working overtime. I feel like I should stay in my pajamas all day, watch cartoons and eat macaroni and cheese. I need to just veg. I don't want to do anything that requires any mental effort. So I left my last job because I was "ready for a challenge." Man, did I get one! This show that I'm producing is a monster. I feel lost in it. It's frustrating because I know how to produce a good newscast it's just I don't know yet how to do that here. I didn't realize how much work it would be, how hard it would be to not be familiar with the area, and how long it takes to get used to a new computer system. I miss Avid. (I know that doesn't mean anything to some of you, but it does to the newsies, I just had to declare that publicly) Every day is getting better, I learn a little more, need a little less help from everyone else... it's just hard to go from the top at one place to being the new kid, the one who "doesn't get it." Everyone is telling me that I'm making good progress and doing a good job... I'm probably just being hard on myself. I just hate screwing up. Unfortunately, that's just part of the process. And this process is the "challenge" I was so up for in the beginning. Sorry for the long vent... It's been a long week. I'll be recharged, well read, and ready to go Monday morning. And this time next week, I won't be as lost. Please pray for me as I grow. I find few things more romantic than this picture. You've probably seen it before. It was taken 60 years ago, on V-J day in Times Square. There is actually a huge controversy over who the couple is. It's kind of a mystery. Who knows. Last year, NBC did a story with three or four old couples that claim to be "the" couple in "the kiss." Does it really matter? The picture represents such passion. A young sailor and a nurse. Victory. Happiness. Peace. In that time, it was precious. I won't be celebrating Valentine's Day this year... but I wish you and yours a good one. Enjoy the moment. --the word "downtown" is actually pronounced "dahntahn" as if it rhymes with "wonton"
Every now and then you come across someone who really makes an impression on you. When I met my friend Susan, I knew almost instantly that we would be friends. She is seriously one of the funniest people I have ever met. We rocked the morning show at WAVY... and talked about how one day we would be off that awful schedule and work together dayside. We did. One of the things I will miss most about WAVY is Susan. She's more than a co-worker, she's a real friend... and that can be hard to come by, especially in this competitive business. I know she will be an awesome mommy, and I can't wait to meet "Baby Tookie." Susan -- if you read this, thank you for being you. I got a new car! It smells new and everything. I am uber-pumped about this. It's the first car I've ever bought. I am spoiled, I know. My last car, the Red Mustang was awesome. I miss it. Mostly because I have such precious memories of my grandfather getting the car for me. It was such a blessing. I was shocked. I know this may sound crazy -- but even though Papa isn't with me anymore, I still feel like he helped me get my new ride. I got the Escape on Ford's "A plan," it's a discount program for family members of Ford employees/retirees. For 30 years, my Papa Tom worked on the assembly line in Norfolk, building dashboards to go in Ford trucks. He retired more than 20 years ago. He passed away in 2003. But he's still with me. All those years of hard work helped me buy this new car. I love it. And I still feel connected to Papa Tom.